Don’t run with scissors. Play nice. Don’t throw rocks. Eat your vegetables. Don’t talk back! Sin was simple back in kindergarten, and so was expiation of that sin. Break a rule, you get a whoopin’. Very simple. By my teenage years we added Don’t Do Drugs. Of course back then, in the Sixties, only the hippies and un-American types did drugs . . .or so I was told. I ran across many kinds of church people as I grew older. Many had an enhanced list of things that were bad — and things that were also bad. This was not ALL church people, but a lot of church people. I remember when I first learned that dancing was a no-no and that things as playing cards, gambling, movies, rock music, and beer greatly displeased God. This was all very disconcerting because at age 18 I liked all that stuff – a lot! After graduating from college I was swooped up by the grace and mercy of God. I decided that I needed to become one of those church people. In the process, I started to try to differentiate between church offenses, cultural taboos, morals, preferences, bad habits, social gaffs, and what God actually views as SIN. It can get confusing. I read my Bible daily. I studied the Scriptures and prayed for insight. Mostly, I devoured the words of Jesus Christ. The beauty of God’s love and the antidote for sin was simple. A theme emerges in Scripture, Christ died for our sins, and arose from the dead for that we might have life – FREEDOM. Max McLean as C.S. Lewis' "Screwtape"
Recently I saw an amazing performance of the classic C.S. Lewis novel, The Screwtape Letters. The play, brilliantly performed by award winning actor Max McLean, follows the schemes and thinking of a demon named Screwtape. The story is based on a view of spiritual warfare from a Hell’s point of view as told to a Junior Devil. So, a few days later as I sat in the movie theater watching The Hunger Games, I was thinking of the psychology of evil. More particularly, the lies and temptations wrought by the Evil One. I couldn’t help but view President Snow as the Devil himself, a schemer. “Hope?” Seneca replies slightly bewildered. “Hope, it is the only thing stronger than fear. A little hope is effective, a lot of hope is dangerous,” Snow declares. “Spark is fine, as long as it’s contained. So, contain it,” Snow warns. On Day 12 I wrote a song as my entry to provide something different than the usual photos, links, videos and commentary. Lookin’ for a bit of lunch. P.S. The photograph is of the door that inspired C.S. Lewis’ “Aslan.” I had to throw in something credible after that ridiculous song. So, if you’ve been in Oklahoma for a few years at some point you’ll hear the joke about Poteau and how the town was named. Not from Oklahoma? Well, it had something to do with someone tripping over the town hall steps and yelling, “Oh – my po’ toe!” (Groan away…please). If you follow that logic, then you can guess how Oxford got it’s name, right? Evidently, the locals used to drive their oxen across the ford. True story. Where was that body of water? Well, it’s still there, and is a feeder river to the Thames, in south central Oxford. How do I know this? Because I stood on Folly Bridge and read a sign. Where did Folly Bridge get it’s name? I don’t know, and neither does Wikipedia. I can tell you that it’s nice…standing on the bridge and looking over the river. The boats floating there now don’t really give you a mental image of peasants driving oxen across the way, but this is the 21st century, eh? I can also tell you that there’s something about Oxford that we won’t have in the US for a long, long time. A sense of permanency about the place. When they build a building, it’s there for ages. The building becomes an institution in and of itself. From my view, it seems that when we build a building in America, there’s a predisposition about the fact that in 50 or 100 years, it must just get torn down and a new one built in its place. The US has contributed great things in the name of Progress. On the other hand, I think that Oxford and its accompanying history have contributed great things in the name of Institution. I mentioned in Day 13’s posting that I would share a bit more of the Literary tour information with you. This particular information is fun. Downright dandy fun. If you are a Chronicles of Narnia fan, then you might recall that when Lucy goes through the Wardrobe to enter Narnia, she passes by a Lamp post and a tree. She then meets Mr. Tumnus. This particular part of the story was influenced by St. Mary’s Passage, adjacent to St. Mary’s Church where C.S. Lewis attended quite frequently and delivered his famous “Weight of Glory” sermon there from the cathedral floor to the parishioners. Well, little did I know that every day at least twice I pass by the lamp post and the beautiful tree that provided inspiration for Lucy’s passageway to Narnia in the Chronicles of Narnia children’s book series. 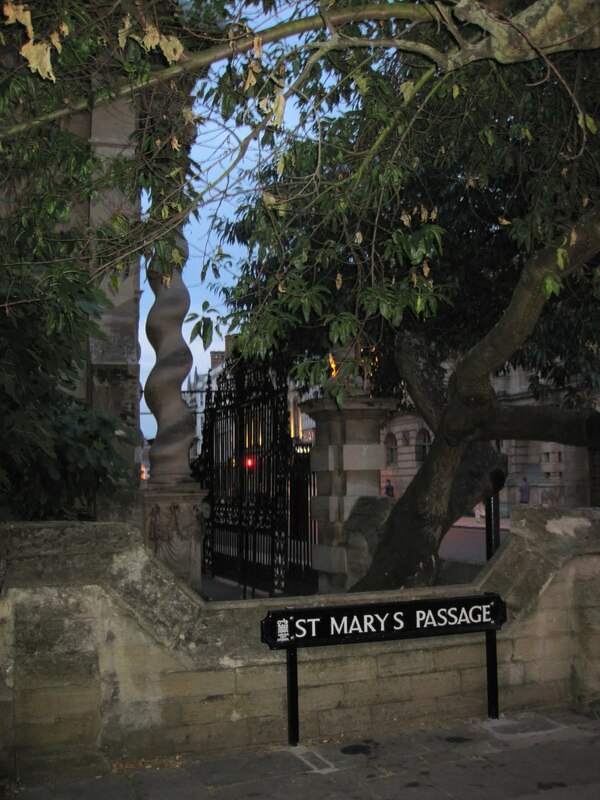 This first picture shows St. Mary’s passage with the lovely tree. The second picture shows the enchanted lamp post. And the third picture shows a carving on Brasenose College that provided the inspiration for Mr. Tumnus. Finally, I’ve attached a fun little video to remind you of the tree, the lamp post and Mr. Tumnus from the movie set to the tune: “Leaning on a Lamp Post.” What fun! Above – here’s the lamp post. You can see the tree and Mr. Tunmus in the background. And…there’s our dear Mr. Tumnus. He was just waiting around for someone like Lewis to create a character on his behalf. There are so many community events going on within Oxford on a daily basis, I have had to monitor their tourism website at least every other day. And while I can’t possibly DO all the things I would like, I MUST DO some of the things I’ve marked most dear to my heart. One of these “most dear” choices was the Tolkien & Lewis Literary walking tour. It only takes place once a month. You purchase tickets for the tour at the visitors center on Broad Street. And…it just so happened that the gentleman from Australia just in front of me in line bought the last one. The tour was full. Perhaps this is where growing up on a farm and getting the job done in “way #2, #3 or #4 if necessary” was helpful? When I had verified that they would indeed not sell any more tickets for this tour, I decided to purchase one for August the 7th…a Saturday. My last day in Oxford. It would be taking place immediately after my last course final and I knew I would be physically zapped. But I also knew that there was perhaps a fleeting chance someone might not show up today. I said a tiny prayer and bought the ticket. I stood around outside and watched those who had the correct tickets for the tour begin to gather. I started counting warm bodies as they showed up and wondered what the cap on the group might be. Every once in a while I made eye contact with the man from Australia. I didn’t see any particular emotion register on his face, and he frequently looked away. I wonder if HE wondered why I was standing around? 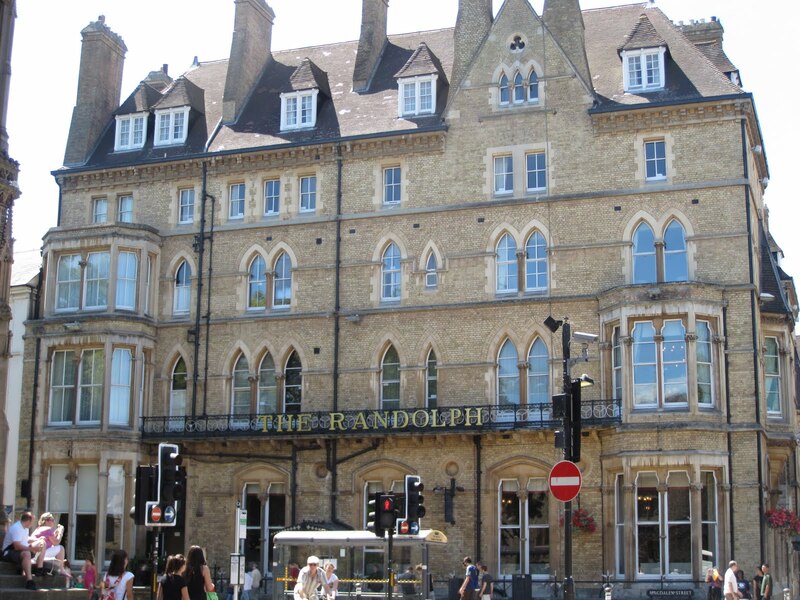 Pictured above – “The Randolf Inn,” where royalty and many historical figures have stayed. The scene in “The Shadowlands” where C.S. Lewis met his future wife was filmed here, in the dining room. Pictured above – “The Eastgate Hotel,” where C.S. Lewis ACTUALLY met his future wife in the dining room. Evidently, the makers of the film thought it wasn’t glorious enough for the big screen. Okay, hurdle number one cleared. Time for hurdle number two: body count. They were only allowed to take 20 on each tour. 20 per month in a town where C.S. Lewis & J.R.R. Tolkien spent the majority of their lives. Go figure. 16 currently stood in the group and had their tickets checked (including me). It seemed that the time between 1:28 and 1:30 passed excruciatingly slowly. “No, no. Of course not!” the guide responded. She then began to provide orientation information to the group about how we had to pay fifty-pence when we got to Merton College, but if we weren’t on the tour we would have had to pay two pounds. One more person showed up. “What have I missed?” they asked. My stress level increased just a bit. We were at 19 including me now. As the tour guide began repeating everything she just said, I began talking to her in my head: “Go! Just go…it’s 1:34…go now!” The lady next to me leaned over, and with a kind smile she looked at me and said, “It’s sort of like waiting to get on a plane using the stand-by method, eh?” I smiled back. Yes. That’s exactly what it was. Exactly. Pictured to the right – the town home where J.R.R. Tolkien lived after his wife passed away. He admitted to being very lonely after her death, but still made time to spend with the students in tutorial, and still taught classes for quite some time. The students seemed to help take his mind off his wife, he admitted, but at this point in time most of his literary friends from the club had died as well. The tour began. Halelujah! We got indoctrinated into more history about the Eagle and the Child, the Lion and the Cross and a few other pubs the “Inklings” club used over the course of twenty or so years between the 40s and 60s. We saw the hotel where C.S. Lewis met his future wife for the first time as mentioned in “The Shadowlands.” I found out that the Church of St. Mary Magdalene (prounounced Moglin) right by Brasenose College is where Lewis delivered his, “Weight of Glory” sermon…one of my favorite essays by him. And then the guide’s cell phone rang. Evidently the last two people who had purchased tickets had been waiting at the Eagle and Child Pub for 1.5 hours for the tour to begin. They had printed material from the internet showing that this was indeed the place where they were supposed to be. She hung up the phone. As she told the group that we would be waiting on them for five minutes to join us the man from Australia looked at me. I looked away and bit my lip. “Yes,” I replied. “Very lucky.” Then he smiled and began walking beside me for the rest of the tour. Perhaps he was relieved as well. The five windows and door on the bottom two floors pictured here are where Tolkien taught. There was a bedroom there where the door was, as academics would travel great distances for tutorials. The accommodations were so that they could spend the night while studying there, or a few days if needed. 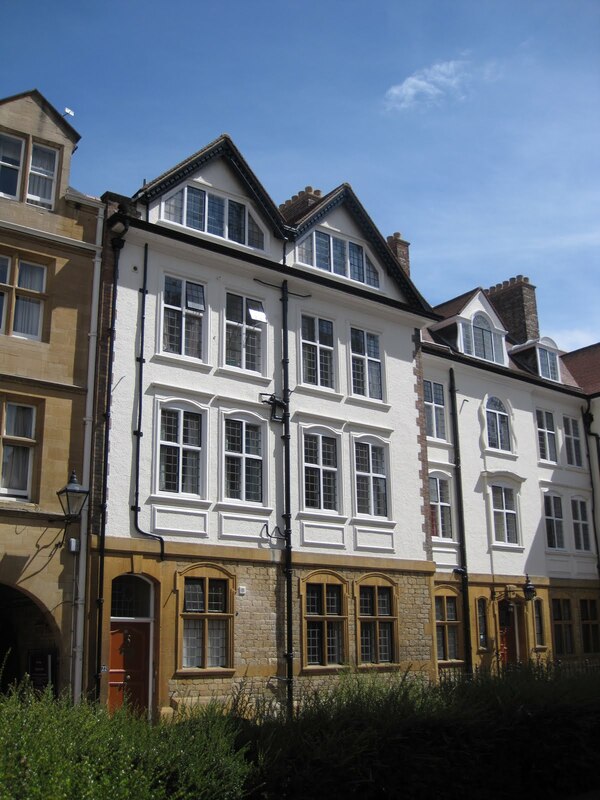 This is one of the oldest buildings in the Oxford colleges. It was built in the mid-13th century. It is the Merton College Library. Each College has a Church, a Dining Hall and a Library. The books were all kept in the upstairs floors due to danger of flooding and mold, and the shelves were built at right angles to the windows in order for any breeze possible to blow through and keep them dry and in good shape. This is the Lamb and Flag pub. The “Inkling” club moved here after the Eagle and the Child (nicknamed the Bird & the Babe by the locals) enforced a no-smoking policy. The Literaries could not see giving up their pipes as inspiration for their discussions. I have more pictures, but I’ll save them for another time…suffice it to say, I saw where the idea for Mr. Tumness originated, the Lamp Post and Tree whereby Lucy entered into Narnia, and all sorts of other sights to see. Nite.